Tanzania sits distinguished as one of our Must-See Travel Destinations, and for good reason. While there are countless moments that will take your breath away in this unparalleled country, here are six of the top experiences to check off your travel bucket list while exploring Tanzania on an African safari. Tanzania is the ultimate place to have a classic safari experience. You’ll see breathtaking wildlife as you zip through the country’s national parks, including the famous Big Five game animals: lions, leopards, elephants, Cape buffalo, and rhinos. One safari tip for Tanzania? Remember that some animals are most difficult to spot than others; don’t get so caught up on searching for the most elusive species (like critically endangered rhinos) that you forget to enjoy all of the other animals you’ll see! 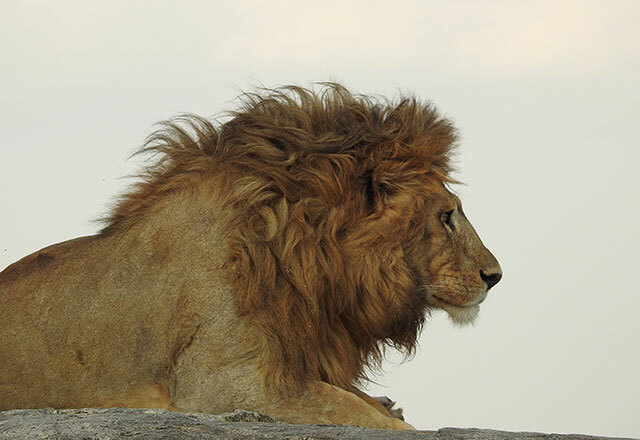 Visiting the Serengeti is the ultimate way to check off more than one bucket list goal at the same time. With a name that means “endless plan” and an area spanning over 12,000 square miles, seeing this UNESCO-listed park is a thrill in its own right. But, what really makes it special is the wildlife that lives there. Along with the Ngorongoro Crater—which is home to some of Earth’s last black rhinos—the Serengeti is one of the only places you’ll visit on safari in Tanzania where you can glimpse all of the Big Five and see the Great Migration. Seeing the vast expanse of the Serengeti is always epic, but being there during the wildebeest migration is another thing entirely. During this yearly migration, millions of wildebeest, zebras, and gazelles make a trek that is considered one of the wonders of the natural world. The moving herd of animals makes its way between Tanzania and Kenya in one of the most impressive displays you could ever hope to see. While annual rainfall impacts the migration’s timing, it commonly crosses through the northern part of the Serengeti in July. Your first glimpse of a Masai tribe member adorned in colorful wraps and jewelry is sure to stop you in your tracks. This welcoming tribe has held on to its customs even as Tanzania has evolved, and exploring one of their bomas, or villages, is a highlight of any safari. 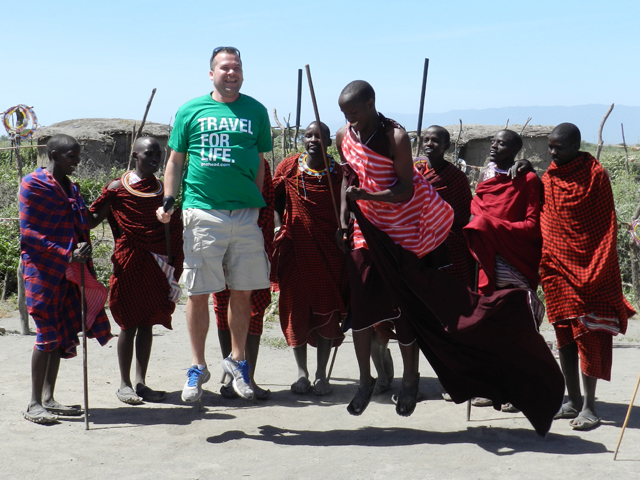 Tribe members greet visitors with their traditional songs and jumping dance—and you might even get a chance to show off your jumping skills alongside the Masai warriors! According to many scientists, some of the most important paleontological findings relating to human evolution can be traced to one spot in Tanzania: Olduvai Gorge (correctly spelled Oldupai in the Masai language). It was at this UNESCO-listed archaeological site, called the “Cradle of Mankind,” that scientists Louis and Mary Leaky unearthed fossils, tools, and footprints that date back millions of years and provide insight into our earliest human ancestors. The best way to cap off adventure-filled days on a Tanzanian safari? By settling in to stunning lodges located within the national parks. Each afternoon, you can sit on an outdoor terrace and enjoy a sundowner, which is a happy hour where you sip local spirits while you watch the sunset over the bush. But, only those who choose to get up early while staying in the Lake Manyara Kilimamoja Lodge, a frequently used hotel on our Tanzania Wildlife Safari, can see the reverse. 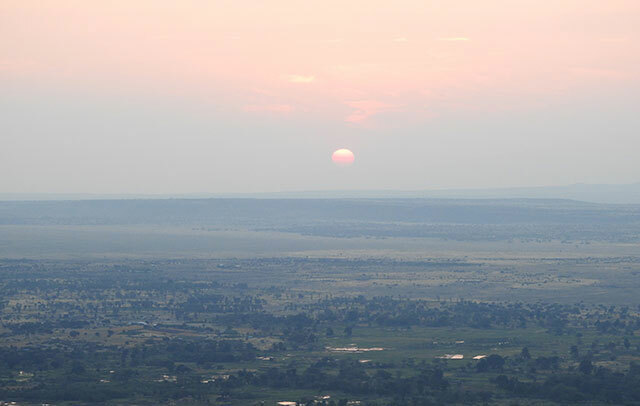 Step outside before daybreak to watch the sun crest the horizon over the Great Rift Valley (which stretches all the way to Egypt!). 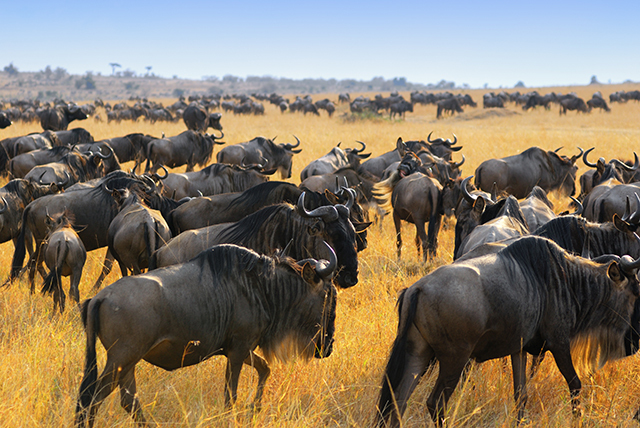 Is going on an African safari on your bucket list? Tell us in the comments!